90007 heads 1H16 1620 London Euston-Manchester Piccadilly at Cathiron on 19/04/2002. 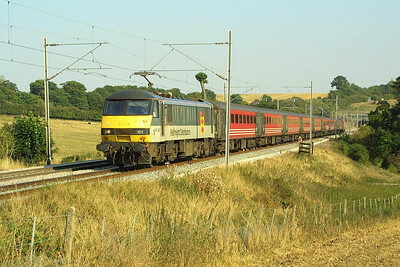 90011 works a Virgin West Coast service northwards at Cathiron on 13/07/2002. 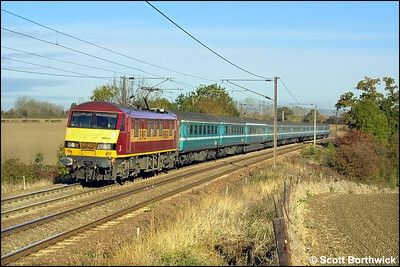 90029 speeds northwards at Cathiron on 24/09/2002 whilst in charge of 1S96 1600 Willesden PRDC-Shieldmuir RMT. 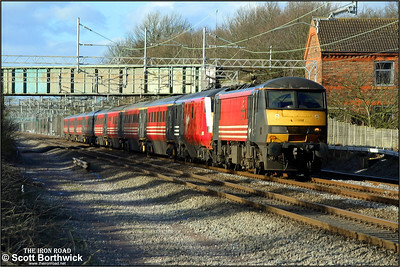 90013 'The Law Society' is dead on the rear of a 1A43 1219 Wolverhampton-London Euston dragged by 47733 at Whitacre Junction on 05/01/2003. 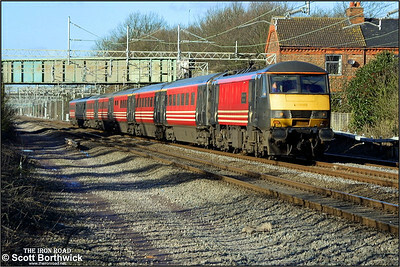 90006 'Modern Railways Magazine/Roger Ford' works a short formed London Euston bound service at Cathiron on 04/02/2003. On the date this photograph was taken, Scotland was experiencing severe adverse snowy weather and locomotives were required to haul, rather than propel trains. 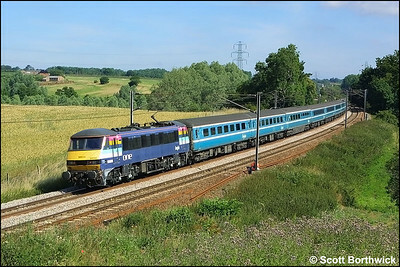 This resulted in a number of sets either having the locomotive hauling the DVT or the set facing the wrong way if it had been turned, resulting in the locomotive being on the London end of the train, rather than the usual country end. 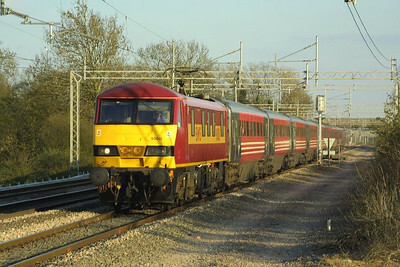 90013 'The Law Society' works a London Euston bound service at Cathiron on 04/02/2003. Due to the adverse snowy weather being experienced in Scotland, locomotives were hauling, rather than propelling trains, resulting in a large number of sets either facing the wrong way or having the locomotive hauling the DVT on the date this photograph was taken. 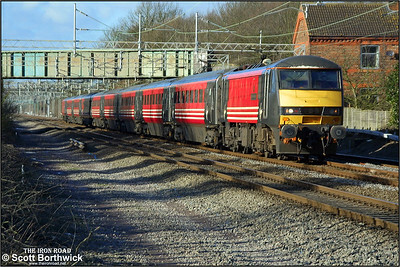 90012 'British Transport Police' heads for London Euston at Cathiron on 04/02/2003. 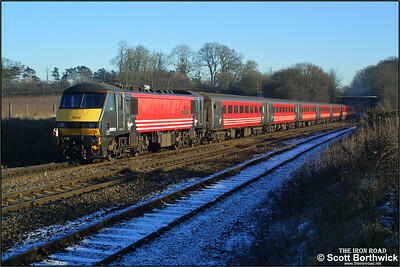 On the date this photograph was taken, Scotland was experiencing severe adverse snowy weather and locomotives were required to haul, rather than propel trains. 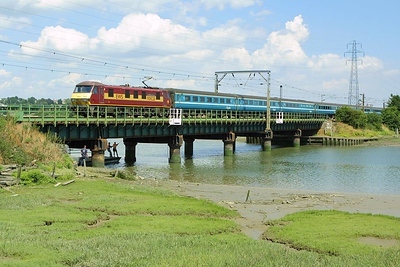 This resulted in a number of sets either having the locomotive hauling the DVT or the set facing the wrong way if it had been turned, resulting in the locomotive being on the London end of the train, rather than the usual country end. 90023 heads 1S96 Willesden PRDC-Shieldmuir RMT at Cathiron on 08/04/2003. 90013 works 1F21 1700 London Euston-Liverpool Lime Street at Cathiron on 08/04/2003. 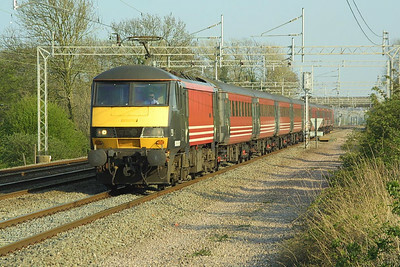 On hire 90018 passes Cathiron on 08/04/2003 whilst working 1H25 1725 London Euston-Manchester Piccadilly. 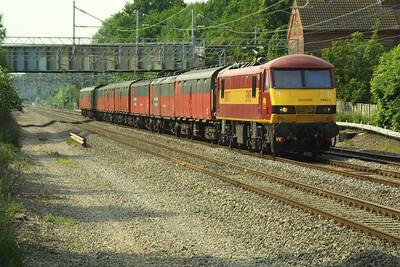 90017 speeds past Cathiron on 13/06/2003 whilst in charge of 1A90 1532 Warrington RMT-Willesden PRDC. 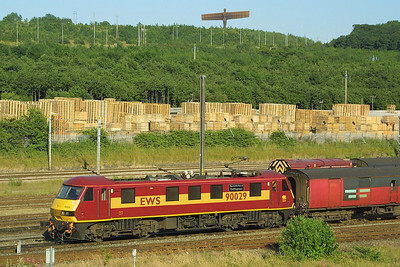 Watched over by 'The Angel of the North', 90029 is pictured at Tyne Yard on the stock of 1V28 2024 Low Fell RMT-Bristol Parkway on 14/7/2003. 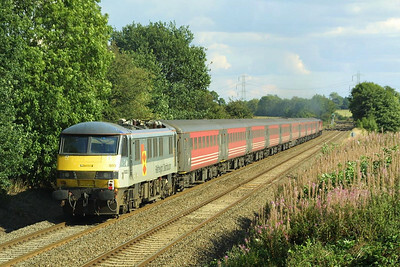 90033 is dead on the rear of 1A59 1519 Wolverhampton-Northampton pictured at Daw Mill as it is dragged by 47810 on 30/08/2003. 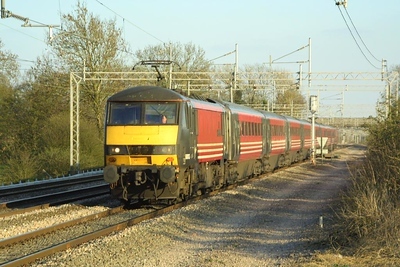 90021 was on hire to Virgin West Coast on 4/9/2003 and it is pictured at Weedon whilst working 1H22 1555 London Euston-Manchester Piccadilly. 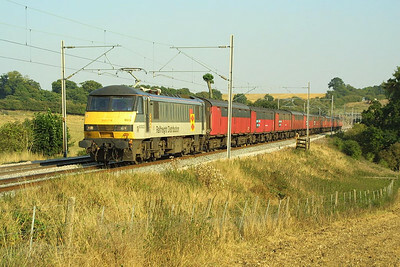 90023 speeds northwards on 4/9/2003 with 1S96 1600 Willesden PRDC-Shieldmuir RMT mail train. 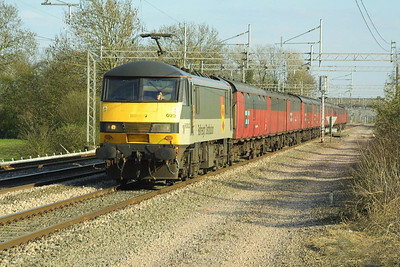 It is seen here at Weedon soon after emerging from Stowe tunnel with its 12 van train. 90034 propels 1P08 0830 London Liverpool Street-Norwich at Dagworth on 25/10/2003. 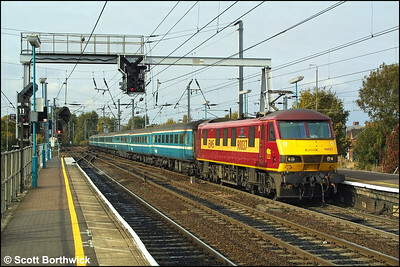 90037 'Spirit of Dagenham' arrives at Ipswich whilst in charge of 1P35 1200 Norwich-London Liverpool Street on 25/10/2003. 90019 propels 1P08 0830 London Liverpool Street-Norwich at Brantham on 06/07/2004. 90006 propels 1P10 1000 London Liverpool Street-Norwich at Brantham on 06/07/2004. 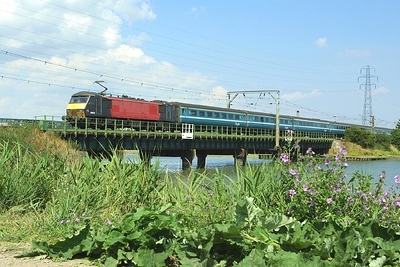 The loco would fail on its next journey south and spend the rest of the day in the sidings at Ipswich, with all of its remaining booked workings for the day being cancelled. 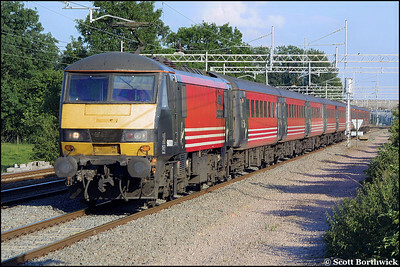 90007 devoid of its Virgin decals propels 1P12 0930 London Liverpool Street-Norwich at Brantham on 06/07/2004. 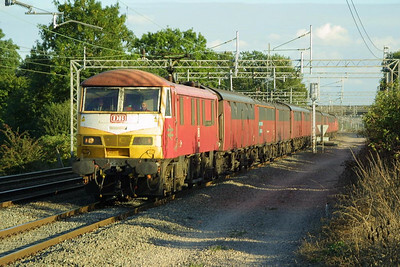 90045 passes Brantham on 06/07/2004 whilst working 4M87 1249 Ipswich Yard-Trafford Park. 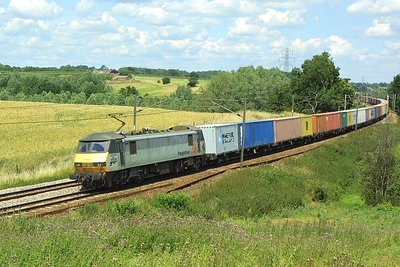 90020 propels 1P24 1230 London Liverpool Street-Norwich across Manningtree Viaduct on 06/07/2004. 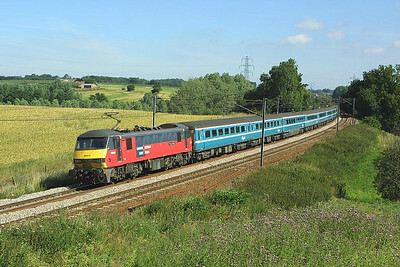 Almost certainly the shabbiest of all the locos working the London-Norwich services, 90012 clearly shows its former Virgin branding scars as it crosses Manningtree Viaduct with 1P41 1340 Norwich-London Liverpool Street on 06/07/2004. 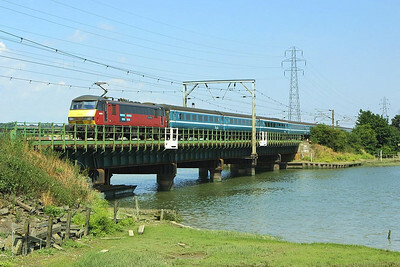 90019 works 1P28 1330 London Liverpool Street-Norwich across Manningtree Viaduct on 06/07/2004.